Remarks: This new wing, designed by I.M. Pei, opened in 1978 to house changing exhibits and the museum's collection of 20th century art. 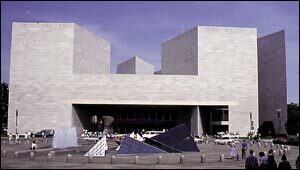 The main part of the building is an isosceles triangle, containing two sides of equal length. 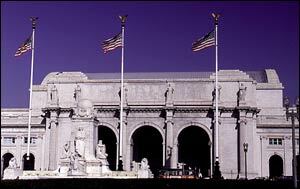 Remarks: Union Station was built to consolidate Washington's passenger train traffic into one location; it was opened to service in 1907. The station, modelled after the Baths of Caracalla in Rome, is 720 feet long; the waiting room is 120 feet wide and 219 feet long, and the vaulted ceiling reaches 96 feet above the floor. A major renovation was completed in 1989, and the building now serves as a National Visitor Center, in addition to being a terminal for train and subway service. Remarks: President Washington laid the southeast cornerstone of the main building September 18, 1793, on the site chosen by L'Enfant. The north wing was completed in 1800; the south wing in 1807. Both wings were burned by the British during the War of 1812 but were restored by 1829. The dome and wings are examples of the Greek Revival style. New wings, built in the 1850's, doubled the length of the building. 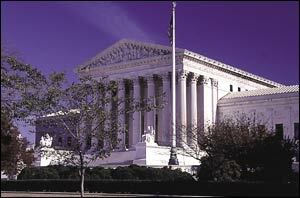 Remarks: This building, the first permanent home of the U.S. Supreme Court, was completed in 1935. 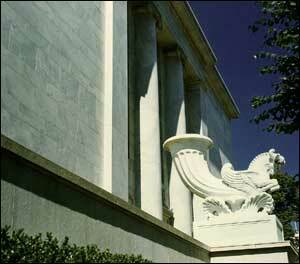 Its central portion is in the style of a Greek temple with Corinthian columns and enormous sculptured bronze doors. Remarks: The main building, named in honor of Thomas Jefferson, is of Italian Renaissance design and was completed in 1897. 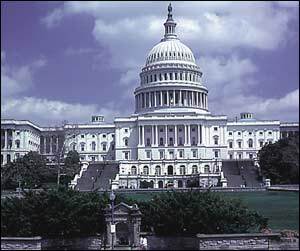 The library has more than 86 million items in its collections, including one of the three existing copies of the Gutenberg Bible (the first book printed with movable type) and a large collection of books printed before 1501; numerous Civil War photographs; recordings of American folk music; and letters, papers, and drafts from many Presidents. 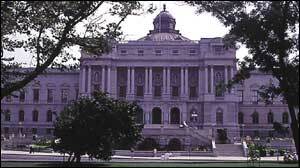 Remarks: William H. Livingston designed the building, which contains 169 suites for Congressmen. The nine-story building was complete in April 1965.